22Dec2001 Movie 'Made In Sheffield' website Sheffield Vision is up. 'Made In Sheffield' tells the story of Sheffields music scene set in that far off era between 1977 and 1982, from how it came about to the international successes of The Human League, Heaven 17, ABC and Cabaret Voltaire. 22Nov2001 A new Vince Clarke, Martyn Ware track called `Massive` will be available near the end of the year on an album called `Music For The 3rd Millennium` a track similar to the Pretentious/SPV albums. The album is limited to 1000 copies only. AMP-CD042. Temptation Germany (Prism 04.Oct.2001) Internal documentation ? No, I'm NOT am employee of Amazon, it's just an example ! If somebody does already own one of this re-releases, please let me know, I'd like to check the details. The re-releases are NOT controlled by the band, as far as I know ! ...we finished mixing the album., It's not yet mastered - but we're very pleased with it. 03Nov2001 Mark Finnigan informed me about the Sheffield International Documentary Festival. "Made In Sheffield" is one of the movies shown and contains a lot of valuable info about Heaven 17. As fas as I know, there is no commercial release available yet. Retox/Detox re-released in the US by Big Eye; ASIN: B00005RGOX scheduled for 13Nov2001. Above is the link to the new Retox, Disc one is song for song the same as disc one on the Eagle /Cleopatra retox dextox, but disc tow is nowhere near the same. Music stores list a new Heaven 17 release due 27Nov2001. Amazon lists this as a US release !?!?! 28Sep2001 Added BEF/Heaven17 - fake page to list some releases which are not from "our" B.E.F. / Heaven 17 although listed on some records stores as regular releases. Heaven 17 start mixing 8 tracks of their brand new album on Sept 17th - the rest will be finished by late October. Have performed 3 new tracks several times - all to excellent reactions. Upcoming arena tour in UK in November with Kim Wilde, Paul Young, Curiosity Killed The Cat, Go West, T'Pau etc. - possible european dates. Martyn just performed new works written by Vince Clarke and Martyn in 3d surround sound format (including ambient versions of Erasure songs) live with Andy Bell and Vince at a huge Sony Playstation 2 party at the Royal Arsenal in London - will release the new material in 2002. Martyn and Vince have formed new company called Illustrious Co. Ltd. to create new works in conjunction with artists and their installations/exhibitions in 3D surround sound. Glenn is working hard on music for various TV shows. I'd like to thank Thomas Fuchs for some Tienen photos. These photos do not show any new insight details, so I'll publish them later on. I think I'll now buy some webspace to be sure of the availability of the 100 MB. If you do have any suggestions, please mail me. 16Aug2001 According to Stephen Budd Management Martyn Ware is still writing and producing new Heaven 17 material (source newsletter July 2001). The National Center for Pop Music is no more it's been run by a company that wants to have luxury toilet gig venues (!) and will be a niteklub by night and a conference centre by day, so the only way to hear Martyn's music for the NCPM is on cd now. Vince & Martyn's new cd got a very nice review in Q. There's a health and beauty shop in Sheffield, on Baslow road called The Luxury Gap and Company!!! 17Jun2001 Some more WMA-Soundclips added. See Multimedia / Sound clips / WMA-Soundclips. For more details see tour2001. Ganymede will soon be working on remixes of his songs Summertime, Despite All Our Worries and Night Club, and there is a possibility that these remixes will be released on a maxi single later this year. Gary has also been slated to appear on an 80s tribute CD that is being produced by the Canadian indie label Kinetic Response. He will be doing covers of Heaven by the Psychedelic Furs, Whisper to a Scream by the Icicle Works and Let Me Go by Heaven 17. Saturday 10th November, Birmingham NEC. Heaven 17 will be appearing along side Paul Young, Kim Wilde, Go West, Nick Heyward, Curiosity Killed The Cat and T'Pau. Currently I do not know any details about this release. 1. Re: News from SBM/ "I Love 1987" Didn't see Mart anywhere on that programme. 2. Mart and Ian were however on another Top Ten programme (Top Ten Electropop Pioneers), this time talking about their time in The Human League, and the years shortly after the Human League split. 01Jun2001 Added some WMA-sound files. See "Multimedia / Sound clips / WMA-Soundclips". First concert review for May 31st gig in Northampton by David Pardoe added. "The Look of Love: The story of the New Romantics ...and Glenn Gregory from Heaven 17 discuss the 80s life in the city, while Richard Kirk from Cabaret Voltaire puts the case for its more underground electronic past"
If anyone missed the recent Radio2 feature on late 70's / early 80's Sheffield music and wants a copy I taped it. It was a great show with contributions from Glenn and Martyn (who revealed that a life-changing moment was hearing 'Trans Europe Express' for the first time at a party thrown by Richard Kirk from Cabaret Voltaire). If anyone wants a copy send an email to andy@mill1768.freeserve.co.uk and I'll return the postage details. Andy asks anyone who wants a copy to send a tape. I spoke to John from the KOP BAND today while trying to get tickets for the upcoming gig in August. He told me that Jarvis Cocker will be DJ for the night. Also tickets are available from Sat 5th May at the following sheffield record stores JACK'S RECORDS 0114 276 6356, RECORD COLLECTOR 0114 266 8493 and FOREVER CHANGES 0114 267 9787. 09Apr2001 HELP ! This week I managed to get an Indonesian MC "Greatest Hits". Does anybody have some additional information about other asian releases who do not match the known release sequence at all ? Fleetwood Owen's Rock and Pop Legends Auction has started handling bids from February 23rd on. It will culminate in a live auction on March 27th at the Hard Rock Cafe, London. The auction has Martyn Ware's personal collection of acetates + production paperwork for Erasure to bid on. Martyn Ware's personal collection of acetates includes Heaven 17, Human League, BEF, Hot Gossip and the Hillsboro' Crew. These acetates are sold on an "as is" basis. As the buyer would have the opportunity to make copies, there is absolutely no return privilege. The production paperwork for Erasure includes a red expanding wallet file labelled Erasure 93-94 Property of Martyn Ware with paperwork documenting Martyn Ware's production work for Erasure at the Church and Windmill Lane Studios. Just to let you know that Martyn Ware from Heaven 17 will be appearing on the show "I Love 1987" on BBC2 this Saturday night. An new album by Vince Clarke (Erasure) and Martyn Ware (Heaven 17/Human League, see photo) is due for release on Mute late April / early May. The album, entitled "Spectrum Pursuit Vehicle", is another abstract, experimental piece of ambient music in a similar vein to their previous collaboration, "Pretentious". According to the Erasure Information Service "the album draws its inspiration from colours and their associated sensations, moods and images, each track evoking a different location and creating the related feelings of beauty, harmony and tranquility in the listener." The release holds 6 tracks that are each approximately 12 minutes long. Unlike "Pretentious", "Spectrum Pursuit Vehicle" is a standard stereophonic release. 08Feb2001 "The mystery of the 5th person" seems to be solved. See picture here. Please check out Madopolis, select category "Pop stars" and you will be able to send an e-card with Heaven 17 picture included. Madopolis organizes some small charities. My personal opinion: things like these won't hurt anybody but they may help. I do only mention Madopolis, because Heaven 17 is included, please do not flood me with other non-Heaven17-related pages to be published, thanks ! Heaven 17 were featured in the February edition of Uncut magazine in the top 100 greatest singles of the post-punk era. They were number 41 with "(We Don't Need This) Fascist Groove Thang". See this article here and please give me a hint who the one white guy is. Due to the fact that more and more people are asking : photomontage of the shirt here, I did not find the time to take a picture for myself and scan it in. But it resembles the original very much ! Still fighting the struggle between quality and size. Still some of the videos are not functioning properly, I'll send out a newsletter when the videos are working again. Sorry for that ! Possibly I have to change the server again, please use only http://www.heaven17.de as bookmark, thanks ! A lot of mails arrived in the last weeks and I did not yet find the time to reply to all of you. I hereby apologize and promise that I'll reply to all of them as soon as I find some quiet time ! I managed to get a small amount of new Fruit-Of-The-Loom Quality-T-Shirts. 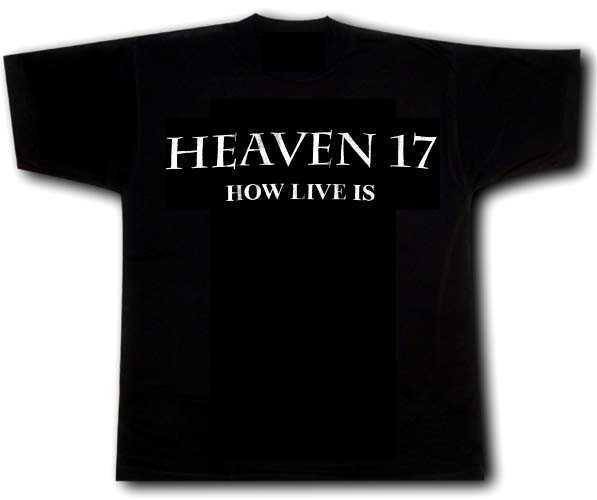 They are XL in size, black and show the HEAVEN 17 name and the text "How Live Is" on the front side printed in white letters. They are originally used as promo shirts for record shops, so you can't get them in a normal shop or via the mercandising page. If you want some of them, please mail me. I do not want to make big money with this, so I'd like to get DEM 20 (USD 10 / EUR 10 / GBP 7) plus p+p each, which is similar to the amout I payed for them.